Cooking is the poetry of housework. But it is satisfying in twenty other different ways as well. There is a grand warm companionable feeling to be got out of the thought that every time you baste a roast or beat an egg or do any other little ordinary kitchen job, you are making yourself one in the the Grand Order of Homemakers, past, present and to come. It was cold here yesterday, with an overcast sky, so I made soda bread to honour Maura. I followed her recipe, it's very similar to my own and although I didn't use her winter buttermilk recipe in this soda bread; I will make it and try it in a future loaf. I used commercial buttermilk. I think soda bread is absolutely delicious made on buttermilk, but if I didn't have any, I'd use whey instead. I always have a jar of whey in the fridge. Using either of them will give your soda bread an extra lift that plain milk just doesn't give. We had warm soda bread for lunch, along with fresh green pea and herb soup. Jamie was here with us and when we went out to pick the peas, we tried not to eat too many of them out in the garden. It's such a temptation. We're growing sugar snap peas and have an over abundance of them, so this was a good reason to thin them out. We used the peas and the pods in the soup to avoid waste. We've been teaching Jamie a few of our most simple chores lately. Saturday was his first day setting the lunch table - just knives and forks with a glass of water for everyone. It's simple and doable for him, and he really loved helping and working with his family. 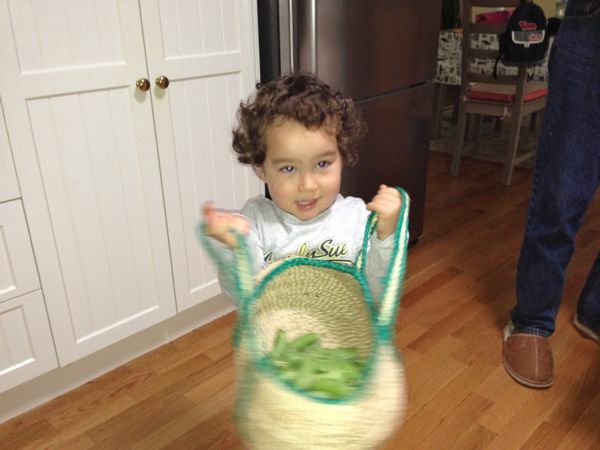 Pea picking is another simple chore for him. All it requires is for the pea pod to be picked from the vine without too much of the vine coming with it. I showed him how I run my thumb nail over the stem and although he can't do that, it loosened the pods enough for him to pick them and put them in the harvest basket. Place all the above in a saucepan and bring to the boil. 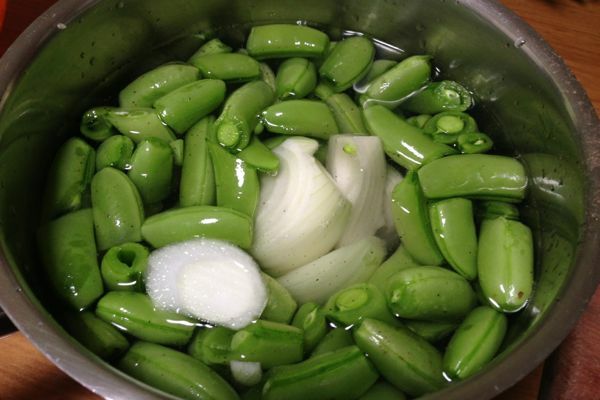 With the lid on, simmer for about five minutes or until the peas have turn bright green. 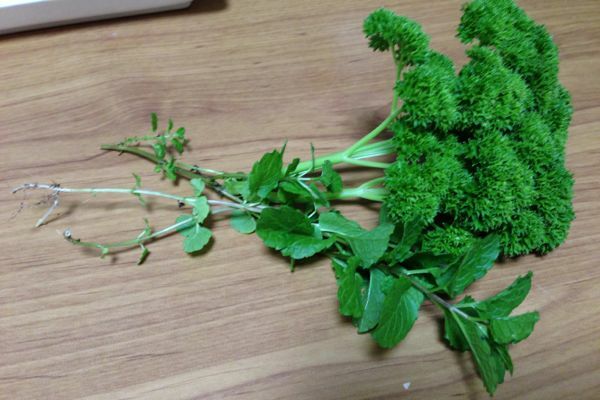 Take off the heat, add mint and parsley, blitz in a food processor or with a stick blender, taste to adjust seasonings. After adding the soup to a bowl, drizzle in a circle of cream or a blob of sour cream. Delicious, and I'm sure Maura would approve of it alongside her soda bread. And another good thing about soda bread is that later in the day, around about afternoon tea time, you can make up a couple of slices with homemade jam and cream. Along with a cup of tea, there is nothing better on a cool Sunday afternoon. No dinner required, thank you. I love soda bread and like you have used whey from yoghurt making and also yoghurt plus milk when buttermilk isn't available (ie don't want to drive to get it-waste of petrol). It has such a beautiful nutty taste when toasted and covered with either home made marmalade or jam. What I love about this recipe is that you don't need oil. I know we need a certain amount of fat in our diet but sometimes I just want something light, but hot, and this recipe does all that. I often have a glut over at the allotment, even though it's tiny, so I could use this recipe in a number of ways. Looking forward to attending the talk at Beerwah Library on Wednesday. Funnily enough I am half through a draft blog post about my daughter walking around her grandparents' garden picking fruit and putting it in her little basket! Such a joyful task! And it makes them so proud! I am a big fan of soup. It's one of those things where the result is always more than the sum of its parts. Rhonda, that soup looks so delicious as well as colourful. Jamie's seems to be getting curly hair! So cute. It must be so nice for you and Hanno to see him so often. He is a real curly top, Chel. We love having him here. I love the sound of this soup. Easy and clean tasting. Jamie is such a cutie . 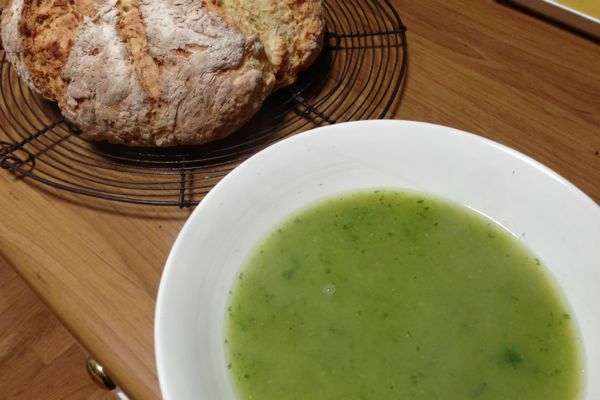 Comfort food at its best - homemade soup with homemade bread. Yummy. 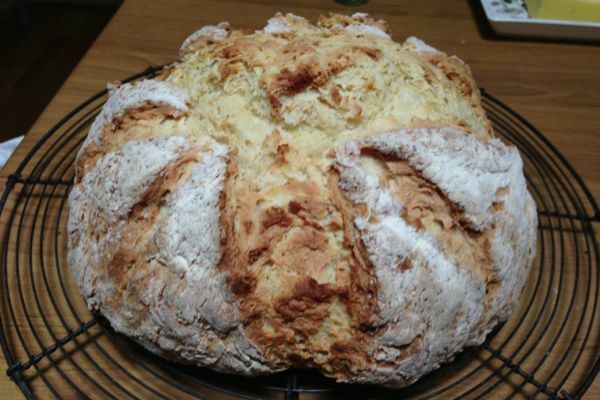 I'm Irish and living in America and you're soda bread picture makes me miss home. I think it's time I started making some recipes from home. Soda bread is great fried!! My dad used to make it for us with a fry on Sunday morns! You butter a slice and then you just fry the bread! Simple as that and gorgeous!! That looks delicious. I have all the soup ingredients in my garden (minus the cream of course! ), this will be fun to prepare with the kids. I've never made soda bread, I'm Welsh but with Irish family and I don't ever remember eating as a child. I now live in the french alps where I can't buy buttermilk so I've been making a sort of equivalent with lemon juice and full milk. 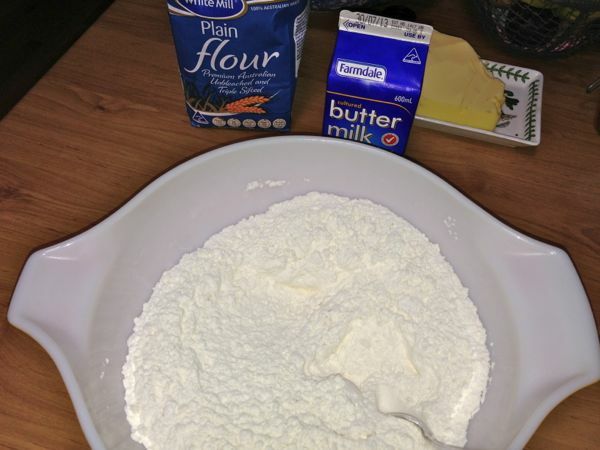 Do you have any quick 'false' buttermilk recipes? 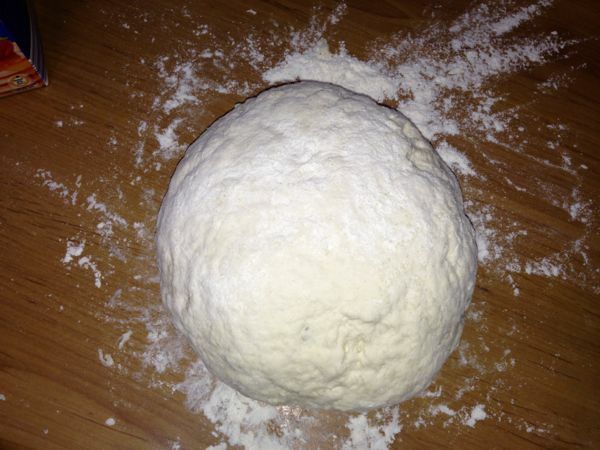 I can't wait to try the soda bread... At the moment I'm waiting on my new stove to be delivered . I've been without an oven since the beginning of May ( we were away for most of that month to visit family in Melbourne )It has taken me so long to find what I want and truth to tell I didn't find exactly the one ,but hopefully I have chosen wisely. Unfortunately it is not an Australian stove. It's a Belling made in the UK. (where I come from). Have heard all good things about this one so fingers crossed. Have you any idea what it feels like not to be able to bake ? I know you will know exactly what I mean Rhonda .... The soup I can make in the next couple of days as I still have the stove top. I'm hoping I can use the peas I froze earlier this year. I will let you know how I go. Today we had baked potato with garlic butter(Tasmanian), grated cheese,(Bega),Coleslaw (cabbage and spring onion from the garden) carrots(Tasmanian), homemade dressing with bacon ,cooked and crumbled by me.... They were delicious! That soda bread looks yummy! I make quite a bit of bread, but you know, I don't think I've ever tried soda bread. Well, we will have to change that! And btw, Jamie is one adorable little guy!